My Love Affair With Pickles. 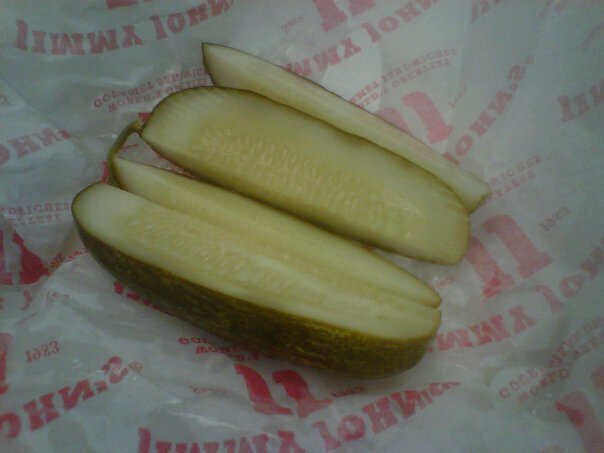 I often order a side of pickles when I go out to eat, if it’s the type of establishment that would support that. When I go out to eat with my Dad, he orders a side of pickles for me without me even asking. I got a jar of pickles from my Secret Santa at work last year. I could eat an entire jar of pickles in the span of an hour, maybe less. Pickles are the only thing I’ve ever been addicted to. I have a pickle Christmas ornament that my Mom gave to me. It’s beautiful. I am Betsy’s dad. She loved pickles long before she went to school, and she cannot stop eating them. Ironically, I don’t really like pickles. I grew up on pickled onions – huge, white onions – pickled – and would eat one layer by layer. One of my favorite childhood memories.